Watch out for Bronagh, Kevin, or Idris - they could prove dangerous. The three names are included in the 21 storm names announced for the 2018/19 season by the Met Office and Met Éireann. 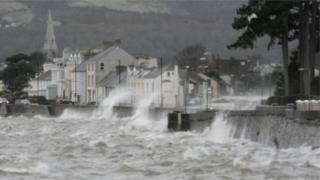 This is the fourth year that names have been used for storms that hit Ireland and Britain. The names are chosen by the public in the UK and the Republic of Ireland, and are aimed at raising awareness of severe weather. "Naming storms has been proved to raise awareness of severe weather in the UK and Ireland, providing a consistent message to the public and crucially prompting people to take action to prevent harm to themselves or to their property" said Derrick Ryall from the Met Office. Previous names have included Aileen, Brian, and Fionn in 2017/18. Storms are named when there is a risk of medium to high impacts from wind, rain, or snow. They are sparked when warning levels reach 'Amber' in the UK and 'Status Orange' in the Republic of Ireland. The letters Q, U, X, Y, and Z are omitted to conform to international storm naming conventions. According to research from the Met Office 77% of people found naming storms useful for making the public aware of severe weather. It also found that 63% of people agreed that storm naming was useful for letting them know when to take action or prepare in advance. Eight storms were named last year, from Aileen in September to Hector in June. In addition, there was also ex-hurricane Ophelia in October but that storm was named by the National Hurricane Center. Once a storm is named it keeps that name. Why do storms have names?